In my previous article I discussed the seeming power struggle in the Premier League between referees, players, managers and fans. As it stands I feel the referees have a disproportionate amount of power compared to accountability. The problem with referees and this power imbalance is that their decisions have such a major impact on the game. As it stands it feels like there is no recourse for bad or missed decisions. If there is a bad call, the game goes on, and it can often end up affecting the outcome of a game or indeed a season. Having a refereeing decision affect a season can be disastrous and means an impact on financial gains (or losses) for clubs. In today’s world of electronic devices and the desire for instant information, the role of the referee seems a relic of a past era. This doesn’t mean there is no place for the referee in the modern game, but there needs to be more changed made to help the match officials instead of leaving everything open to human error. Forget about the talk of it ruining the game. Those are close minded thoughts from so called “purists” that would choose to never change anything if given the chance. The fact is that soccer is always evolving, but for some reason this one thing has been pushed aside time and time again despite the advances being made daily. It makes absolutely no sense to me. At the moment the only use of the fourth official is to hold up a board with numbers on it once in awhile and be the whipping boy for both managers. He is already standing on the side of the pitch with a headset connecting him to the referee. The fourth official is in the perfect place to review replays on a monitor set up for him and relay what he sees to the referee. Many times there are already stoppages in play for controversial calls worthy of replay, so it’s not adding anything that’s not already being taken. Here are 5 reasons video needs to be used in soccer. Next season the EPL is planning to introduce the use of goal line technology, but that only really covers one part of the pitch. It is a very important step and I’m excited to see how it works. I think it is going to be a massive help for the referees. Having goal line technology in place means that the referees and linesmen are able to put more of their focus on the play going on; it takes away some of the pressure of having to watch for: fouls in the box, offsides calls and seeing if the ball crosses the goal line or end line. By not having to keep such a watch out for the ball crossing the line, they can do a better job of getting calls off the ball correct. 2.) Why can’t it be used for offsides decisions? With rule changes to offsides being made nearly every season this is the most difficult decision for the linesman to make, albeit, it’s about the only decision they really have to make. With video technology in place referees can be sure that the correct call is made. How many times have goals been ruled out due to a wrong offsides call being made? I would say that it is enough times that having some kind of technology in place would be huge. I can’t say that I have any great ideas, but if it’s a close call that could result in a goal (or does result in a goal) have the linesman hold his flag halfway up and play continues for a set period of time. Play can continue or stop based on what has occurred. I’ll admit that I haven’t thought this through completely, but there is surely a way to make it work. The recent tackle by Callum McManaman and the fallout from it have really brought this to my mind. It would’ve been so easy for the fourth official to see what happened on the video feed and relay that to the referee. McManaman would’ve been sent off and perhaps Newcastle would have won. At the time of writing this Wigan’s win means they are at a point where they have a chance of getting out of relegation. This means that another team will be sent down in their place. If this win is the difference then it shows how much refereeing decisions change games. When there are bad tackles there is almost always a chance for the referee to look at video and get the call right (including any fighting between players during the delay) and give the appropriate punishment. Even if this means that he sees there was no foul, but rather simulation instead. That way the right person is the one getting the consequence. Looking at the recent week 30 Premier League match between Wigan and Newcastle as well as Sunderland v Norwich there were a few incidents that would’ve been perfect for video technology. Video replays would have shown that Wigan’s winner should have been pulled back for handball and Norwich should have had a penalty for a Danny Rose handball in the box. These are the sort of incidents that are perfect for video technology. In both cases there were already stoppages in play and the fourth official could have seen them and informed the referee. I think the idea of video technology is a necessary instrument for getting these game changing calls correct. There’s no need for so much controversy when the technology is available for use. 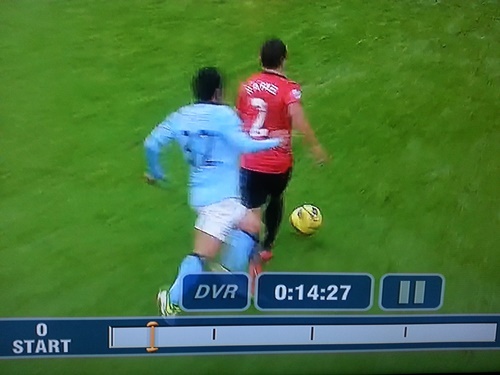 Referees can look at the video and see if there was a handball or foul or even if it was a dive or simulation. Diving (or simulation) is becoming an increasing problem in football, and especially in the EPL. It is often an infuriating part of the sport, but there is no need for it to get out of hand. Video tech is perhaps the best tool that can be used to curb this annoying habit of some players. When referees are given the ability to re-watch these plays they can get the calls right. At the same time, if players know that the game is being watched so closely, they will learn and begin to regulate themselves. There are times when a player embellishes to ensure the referee sees a foul or makes a call, but there are plenty of other times when a player blatantly falls over because they think the referee can’t see what’s going on. I know that using replays is not a panacea and that there will still be controversial calls, but the point is that having access to video will help referees with their job. When a referee knows that they can get a call absolutely correct, it has got to help their confidence and take some of the pressure off. There will always be a certain amount of subjectivity in football, even when video replays are available. In that way the purists will always have something they can look to. There are always going to be gray areas in the laws and there will still be human error, but they need to limit the amount of human error that is persistent in the sport. Too often referees are getting crucial calls wrong and do not have the opportunity to go back and reverse these decisions. It is necessary to help them by giving them the same tools that every fan has at their disposal. I do believe it is just a matter of time before replay of some kind is added. Take a look at the other “British Empire” sports: Cricket, Tennis and Rugby have all added video technology and are prospering with it. It is just sad that soccer has been so slow to adopt this change and move forward into the 21st century.